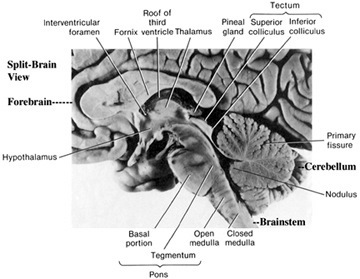 The cerebellum sits atop the brainstem and accounts for approximately 25% of the brain. 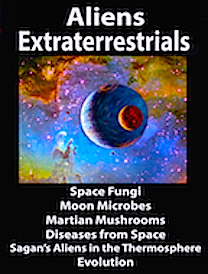 It communicates with almost all regions of the neuroaxis, with the single exception of the striatum, and has been implicated in cognitive, emotional, sensory, motor and speech processing (Carpenter, 1959; Llinas & Sotelo, 1992; Schmahmann, 2014; Silveri et al. 1994; Thach, 2002; van Dongen et al. 1994; Wallesch & Horn 1990; Zanchetti & Zoccolini, 1954) . The cerebellum has been shown to display neuroplasticity (Nimura et al., 1999) and learning and memory (Fiez et al. 1992; Lavond et al. 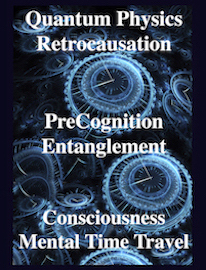 1990; Molinari, et al., 2004; Thompson et al., 2004) and may well serve as an integrative interface for cognition, emotion, motor functioning and memory. As summarized by Schmahmann (2004, p. 16), the cerebellum appears to exert significant influences on "autonomic functions, conditioned learning, visual spatial skills... linguistic processing, mental imagery, cognitive flexibility, sensory discrimination, classical conditioning, verbal memory, attention, and emotional states." 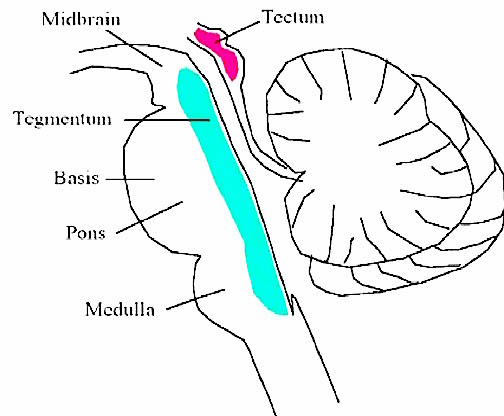 The cerebellum is typically thought of as a motor center. However, almost fifty years ago electrical stimulation or damage to this structure was shown to trigger rage reactions (Zanchetti & Zoccolini, 1954; see also Bharos, et al. 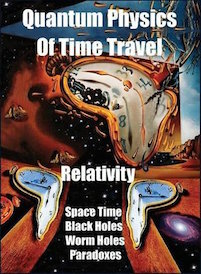 1981), and constant states of hyperactivity (Carpenter, 1959). In fact, "childhood mania" has been associated with dysplasia of the cerebellum (Cutting, 1976). Moreover, Heath et al., (1974) found with humans subjects, that the experience of rage, anger or fear was associated with increased activity in the cerebellum, and that intractable aggression could be controlled or completely eliminated by chronic stimulation of the fastigal nucleus (Heath, 1977). More recently, abnormalities in the cerebellum have also been implicated in the pathogenesis of schizophrenia and autism (Bauman & Kemper, 2015; Courchesne & Plante, 1996; Gaffeny, et al. 1987; Heath, 1977; Heath, et al. 1979, 1982; Taylor 1991; Weinberger et al. 1979, 1980), as well as post-injury/surgery mutism and highly abnormal emotional behavior which resolves after a few days or weeks (Pollack, 2004; van Dongen et al. 1994). Although the notion that abnormal rearing conditions may contribute to autistic and schizophrenic behavior is no longer in fashion, it is noteworthy that Heath (1972) found that monkeys reared under deprived conditions displayed abnormal electrophysiological activity in the cerebellum (dentate gyrus) as well as the septal nuclei. As detailed in chpater 28, these animals also displayed autistic behavior (Harlow & Harlow, 1965a,b). These findings are significant, for the cerebellum is an outgrowth of the vestibular system, and insufficient social-emotional or physical stimulation would also result in insufficient vestibular activation. These and related emotional changes, such as following cerebellar injury, may be related to the rich interconnections maintained between the cerebellum and the amygdala, hypothalamus, and septal nuclei, and the role of the cerebellum in regulating or synthesizing motor and emotional behaviors (Heath, 1971; Heath & Harper, 1974). Indeed, almost 30 years ago Prescott (1971), hypothesized that the cerebellum is involved in all aspects of emotion and emotional development, acting as a "master integrator and regulatory system for sensory-emotional and motor processes." However, as the cerebellum consists of a number of structures, it also appears that different regions are concerned with different functions that also have a major motor component. These functions include speech (Silveri et al. 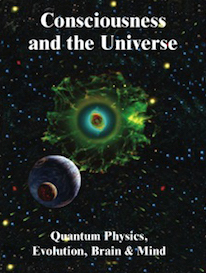 2011; van Dongen et al. 2014; Wallesch & Horn 1990), and visual processing, including the visual guidance of movement (Bloedel 1992; Stein & Glickstein 1992). Because, ultimate, the cerebellum plays such a significant role in different aspect of movement, stereotypically, when injured patients suffer from motor related distubances including tremor, nystagmus, gait disturbances, incoordination, and postural instability, as well as a host of affective and cognitive abnormalities, including schizophrenia and autism. The cerebellum first evolved over 450 million years, well before the emergence of the first vertebrates, and is thus a characteristic part of the brain in cartilaginous fish and prevertebrates, as well as in fish, amphibians, reptiles, birds, and mammals (Larsell, 1967-1972). Specifically, the cerebellum evolved out of the vestibular nuclei and is derived from the rhombic lip and ectodermal thickenings around the cephalic borders of the fourth ventricle. The cerebellum, however, began as a rudimentary appendage to the brainstem, as is evident in hagfish and lampreys, and then progressively increased in size in the progression from fish to mammals. 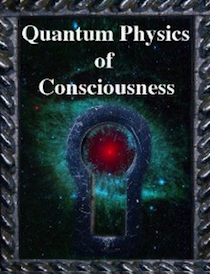 Specifically, whereas initially it received information from the lateral line organs and vestibular complex of the fish (which conveyed information regarding balance and a primitive form of hearing via vibration), as animals took to living on dry land, it began to progressively expand in accordance with the increased input being provided, receiving visual, proprioceptive, somesthetic, and complex auditory stimuli. 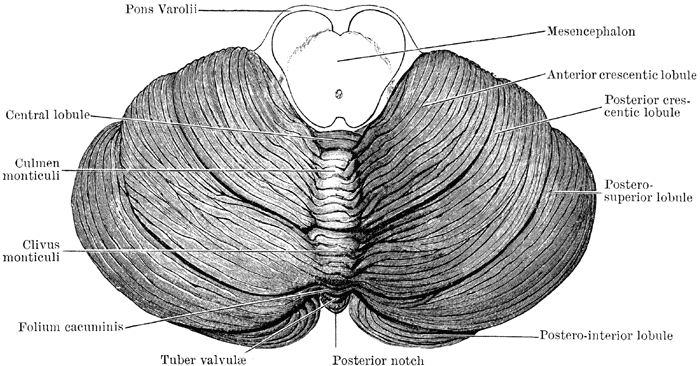 Moreover, the cerebellum began to expand in parallel with the increased size and complexity of the telencephalon--structures which would also transmit to as well as receive input from the cerebellum. As an evolutionary outgrowth of the vestibular system, a primary concern of the cerebellum has been and continues to be stabilizing the body and providing information about the position and movement of the head in relation to gravity. Initially, however, during the early stages of evolution, as primitive creatures were without limbs, they possessed only a small nubbin of cerebellum - referred to as the flocculonodular lobe -what would become the paleocerebellum (also referred to as the archicerebellum). This tissue presumably acted to coordinate the axial muscles with the position of the head, trunk, and eyes, and probably also acted to integrate these movements in response to motivational commands transmitted by the limbic system. In modern creatures, including humans, disequilibrium of stance and gait with little or no extremity dystaxia is usually due to lesions in the flocculonodular lobe (caudal vermis). With the evolution of legs, the cerebellum was forced to assume new roles, including the coordination of axial (trunk) and appendicular (limb) muscles which it influences via feedback from the spinocerebellar tracts. The anterior lobes of the cerebellum began to evolve in order to meet these demands. Thus disturbances of this region can result in dystaxia predominately in the legs. Disturbances such as these are often the consequence of alcoholism and nutritional deficiency (Adams & Victor 1993). With the emergence of bipedal posture increasingly complex demands were placed on the anterior and the emerging posterior cerebellum in order to coordinate gait and upper as well as lower limb movements. 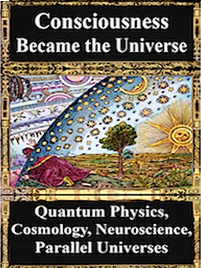 This gave rise to the evolution of the neocerebellum (including the dentate gyrus and the cerebellar hemispheres), which in turn paralleled neocortical expansion in the forebrain and the development of temporal sequential and fine motor functioning. Thus the denate gyrus (of the neocerebellum) controls voluntary actions and direction of movement involving multiple joints (Kane, et al. 2008) and the upper limbs. Dentate neurons also tend to respond or alter their response prior to changes in the EMG or neuronal activity in the MC (Thach, 1978) indicating they are involved in preprogramming. Hence, disturbances of the neocerrebellum (and the dentate gyrus, posterior lobes) can give rise to ataxia of the upper musculature as well as the lower half of the body. Despite its long and varied evolutionary history, the cerebellum is strinkingly homogeneous in appearance and consists of a 3-layered cortex which overlays and communicate with three pairs of deep cerebellar nuclei: the dentate, fastigious, and interpositus. In addition, the cerebellum can be structurally as well as functionally subdivided into three lobes: the anterior, posterior and flocculonodular lobes--each of which can be further subdivided into 10 lobules. Because of the pattern of projection fibers to and from the deep nuclei, the body of the cerebellum can also be subdivided into three longitudinal zones, each of which conveys and receives different types of information. For example, the lateral zone receives (via the pons) information from the motor and somesthetic cortex. The medial zone receives vestibular, visual, auditory, as well as visual input. The intermediate zone receives input from the spinal cord as well as from the motor cortex. 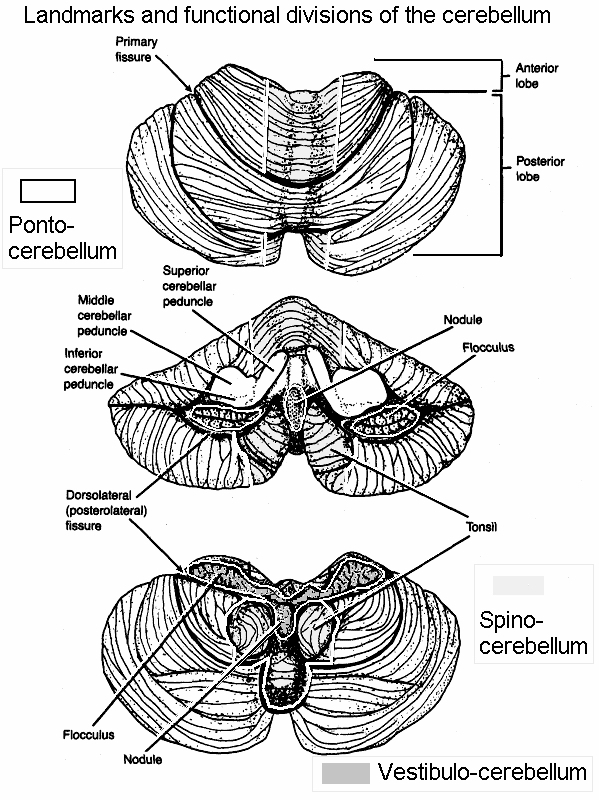 Phylogenetically and functionally, the cerebellum can also be divided into three parts, the archicerebellum (which includes the flocculonodular lobe), the paleocerebellum (or anterior lobe) which influences autonomic and emotional activity, and the most recently evolved neocerebellum which includes the posterior lobe and detate gyrus and which influences motor, somatic, and cognitive activities, and which is thus involved in neocortical information processing (Leiner, et al. 1986). Because of its homogeneity different investigators have attempted to subdivide the cerebellum based on different criteria, thus engendering some confusion as they have come up with different names. For example, Fulton and Dow (Botterell & Fulton, 1938, Dow, 1938) subdivided the cerebellum in accordance with the symptoms produced when injured. For example, since lesions in the vicinity of the flocculonodular lobe produced disturbances associated with the vestibular system (e.g. head tilt, circling gait, nystagmus) they refer to this area as the vestibulocerebellum. Because injuries in the vicinity of the anterior lobe result in abnormal spinal control over walking, i.e. impaired gait without impaired reaching, they refer to this area as the spinocerebellum. By contrast, since lesions of the neocerebellum result in impaired reaching and clumsiness suggesting impairments in voluntary motor control, they refer to this area as the cerebrocebellum. Some of these areas also maintain semi-independent somatopic maps. For example, the anterior lobe (spinocerebellum), maintains a motor map of the body such that cells concerned with the head are clumped together in a posterior location, whereas those concerned with the limbs are clumped together laterally, whereas the trunk is represented in the middle of the anterior lobe (Thach et al., 1992). In this regard, some investigators believe that the lateral cerebellum controls the limbs, the midline controls the trunk, and the posterior cerebellum controls the head. 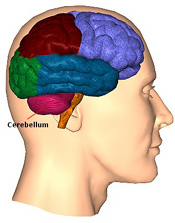 As noted, the cerebellum consists of a three-layered cerebellar cortex (i.e. a molecular, Purkinje, and granular layer), beneath which course thick sheets of axonal fibers (medullary substance) thereby forming the white matter. 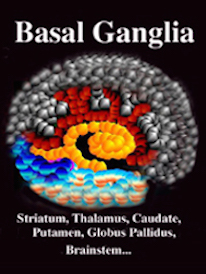 Within the white matter are embedded the three pairs of intrinsic nuclei: the dentate, fastigious, and interpositus. 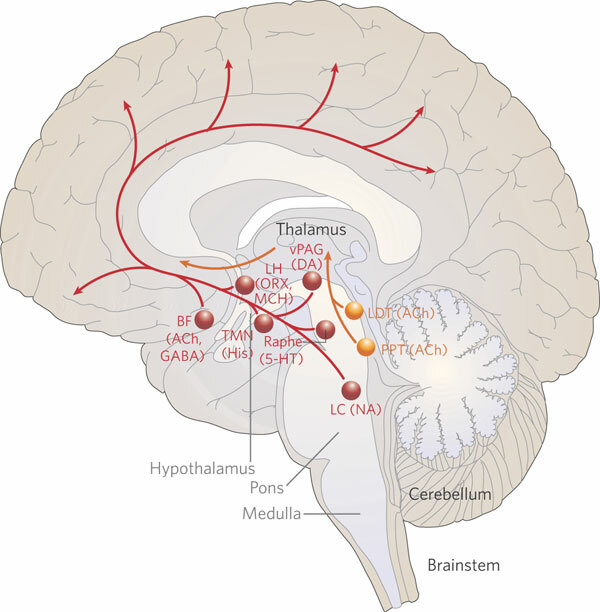 The cerebellum is richly interconnected with almost all regions of the forebrain and telencephalon (with the exception of the striatum) through a number of feedfoward and feedback loops involving the corticopontine and pontocerebellar thalamocrotical pathways (Schmahmann & Pandya, 2004). 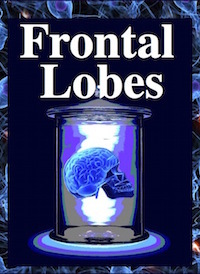 Information is shunted primarily to the cerebellar cortex via fiber tracts that course through the middle cerebellar peduncles which anchor the cerebellum to the brainstem (Llinas & Sotelo, 1992; Schmahmann & Pandya, 2004). This includes afferents that convey tactile, auditory and visual impulses, including those which essentially reconstruct and maintain somesthetic images of the body within the different lobules. These impulses are conveyed predominantly via mossy fibers, which are the major input source to the cerebellum and which convey motor impulses from the motor areas in the frontal lobe (Llinas & Sotelo, 1992; Schmahmann & Pandya, 2004). Mossy fibers are generally excitatory and utilize glutamate as a neurotransmitter, and synapse with Golgi cells whose axons (parallel fibers) excite Purkinje cells. Purkinje cells are all innervated by climbing fibers from the brainstem which also use glutamate as a neurotransmitter (Llinas, 1981). Hence, it appears that climbing fibers and mossy fibers each transmit excitatory impulses to the cerebellum. 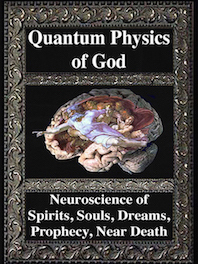 However, these impulses appear to counter one another and can give rise to long term potentiation, or long term depression (Bloedel, et al., 2015; Ekerot & Kano, 2015)--prolonged neural activity and lack of activity which are implicated in learning (chapter 14). In addition, Purkinje cells receive NE from the locus ceruleus and serotonin from the raphe nucleus. Cerebellar output is a function of the deep cerebellar nuclei, each of which maintains a semi-independent map of the body. As noted, the head, trunk and extremities are represented in the posterior, medial and lateral regions. These maps are also ipsilateral. That is, the right arm and leg are represented in the right lateral portion, and the left arm and leg in the left lateral portion (Thach, et al., 1992). These deep nuclei, in turn project to every motor area in the brain and spinal cord with the exception of the striatum, and exert excitatory influences. The cerebellum is tonically active, and presumably exerts a tonic and stabilizing influence on motor function (Llinas, 1981). Moreover, by altering its activity (e.g., Bloedel, et al., 2015; Thach, 1978), it can apparently coordinate, smooth, fine tune, as well as exert a timing influence on motor movements (Ivry, 2004; Llinas, 1981; Llinas & Sotelo, 1992). During movement, activity significantly increases in these deep structures, depending on the body part being moved. Moreover, these cerebellar neurons vary their firing rate during movement, increasing and then decreasing, thus suggesting that they are modulating these movements (Bloedel, et al., 2015; Llinas, 1981; Thach, 1978). Moreover, activity in some deep nuclei, such as the dentate, become active prior to movement and prior to activation of the frontal motor cortex (Thach, 1978). They may fire by just thinking about making a movement (e.g., Dacety et al. 1990). Indeed, the cerebellum is associated not just with motor functioning, but classical conditioning and the learning of new motor programs (Llinas & Sotelo, 1992; Schmahmann, 2004). For example, it has been suggested the the acquisition of skilled movements, such as playing a guitar or a piano, requires neocortical and conscious control over motor functioning, with the cerebellum playing at best a minimal supplementary role. "Practice makes perfect" and presumably, the cerebellum immediately begins to increase its participation and slowly begins to learn the necessary movements. 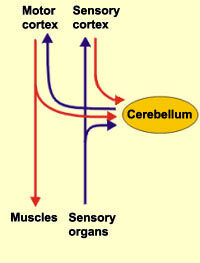 The cerebellum in fact becomes activated during initial learning stages (Watanabe, 1984). As further discussed by Thach (2004, p. 600), as motor learning proceeds, such as in learning to play a particular musical piece, the cerebellum may begin to acquire control over the task. 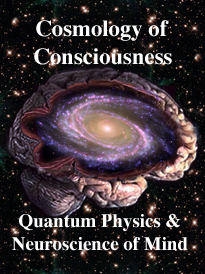 It recognizes the contexts in which each "piece" of consciously initiated movement occurs. After repeated tries it links that context within itself to the movement generators so that the occurrence of the context automatically triggers the movement. Thus with time and practice, the cerebellum largely controls the process, with little or no help from the cerebrum and the conscious mind which are free to do and think about other things. Control of the task has been shifted from conscious cortical control to the subconscious control of the cerebellum." As noted, cerebellar climbing fibers become activated during early learning stages (Watanabe, 1984). In addition, mossy fibers become activated and appear to monitor and modulate related and ongoing activity during the learning process and while engaged in motor tasks; i.e. the "context." Conversely, lesions abolish the acquisition and retention of conditioned responses (Lavond et al. 1990), and compound movements are more severely effected that simple movements. This suggests that the cerebellum may act to integrate and combine different movements, and movement sequences, with climbing fibers acting to learn the task, mossy fibers learning the "context," and parallel fibers integrating the context with the actual motor activity, and even correcting errors (reviewed in Thach, 2004). In fact, when asked to imagine motor movements (Dacety et al. 1990) as well as when engaged in skill learning (Doyon, 2004) cerebellar blood flow increases. Hence, it appears that the cerebellum plays a major role in memory and complex learning. As argued by Thompson and colleagues (2004, p. 151), "it now seems conclusive that the memory traces for the basic category of associative learning are formed and stored in the cerebellum." Indeed, according to Doyon (2004, p. 288), the cerebellum "contributes to the retrieval of learning sequences of movements, as well as verbal semantic information" and "blood flow changes have been seen at different stages of the acquisition of a skill. In fact, modulations of activity have been observed in the early stages of the learning process" and "differential cerebellar activity was found somewhat later in the acquisition process when subjects achieved a level of automatization of the skill." On the other hand, it has also been argued that what the cerebellum appears to learn are habits, and that it does not act to form memories per se (Bloedel 1992). That is, the cerebellum learns automatically, without thinking or conscious thought. 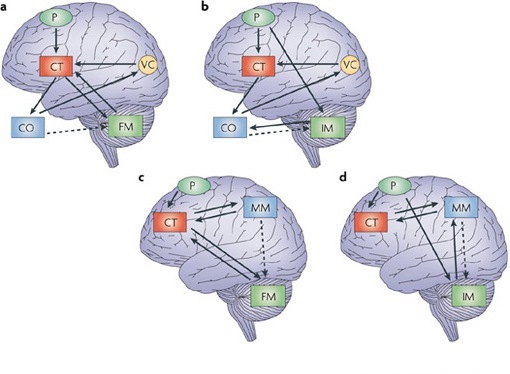 Motor learning and motor habit formation are associated with the functional integrity of the different regions of the cerebellum, the neocerebellum in particular which maintains rich interconnections with forebrain motor areas (Schmahmann & Pandya, 2004). 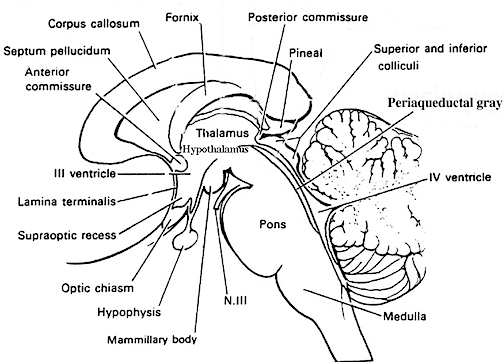 Specifically the neocerebellum projects to the motor thalamus, which relays these impulses to motor areas 4 and 6 in the frontal lobe and the somatosensory areas of the parietal lobe (Sasaki, 1979; Schmahmann & Pandya, 2004). In general, neocortical information is relayed to the neocerebellum via the pons, which in turn acts to relay information from the neocerebellum to the neocortex directly and via thalamic relays (Miyata & Sasaki, 1983; Schmahmann & Pandya, 2004). As noted, the neocerebellum (i.e. 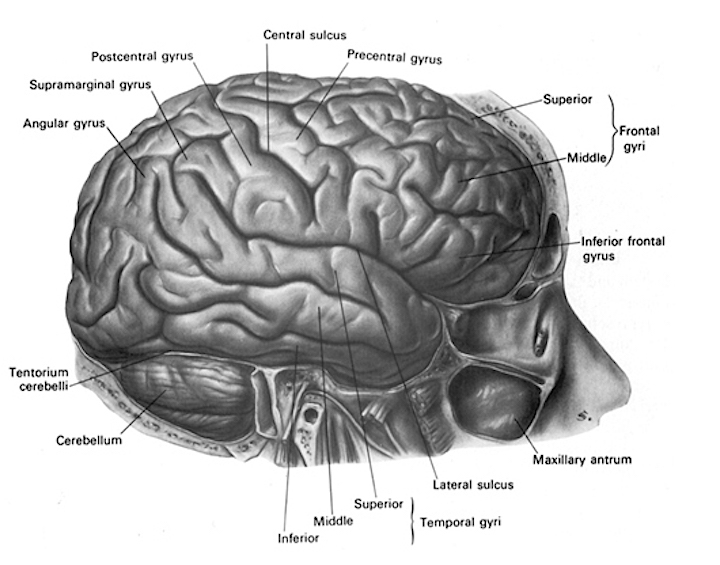 the dentate gyrus) appears to be involved in planning motor movements, including the direction of movement. For example, neuronal modulation occurs in relationship to ongoing movement and in response to activation of the muscles that generate those movements (Bloedel, 1992). In the early part of the 20th century, Gordon Holmes (1917, 1939) published detailed descriptions of disturbances of the cerebellum secondary to discrete and not so discrete lesions secondary to gunshot wounds. As detailed by Holmes, these deficits involve voluntary and skilled motor functions, and patients may display gait ataxia, dysarthria, vertigo, hypotonia, intention tremor, as well as abnormalties in the force, accuracy, range, and rate of goal directed voluntary movements (Holmes, 1917, 1939). 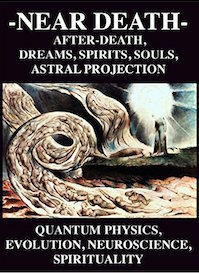 Similarly, visually guided tracking movements and thus determination of movement trajectory is disrupted (Beppu, et al. 2004; Miall, et al., 2017); e.g. past pointing; distances are incorrectly judged and the patient may fall short or go to far when attempting to touch or grasp an object. Cerebellar deficits include ataxia (cerebellar gait), intention/action tremor, dysmetria, nystagmus, hypotonia, asynergia, and dysdiachokinesia. Ataxia is a disorder of coordination such that movements between different body parts are no longer coordinated, thus giving rise to disturbances of gait or arm movements. Intention tremor may involve the limbs or the trunk (titubation) such that there are involuntary movements and oscillations of the body during movement, but not while at rest; that is, with the exception of standing in which case the trunk may oscillate. Dysmetria can be characterized by over reaching (past pointing/hypermetria) or under reaching (hypometria) when grasping for objects, Moreover, when making rapid movements, they may move too rapidly, and when making slow movements, they may move very slowly. Nystagmus involves involuntary sow and fast rhythmic lateral eye movements usually to the side of the lesion. 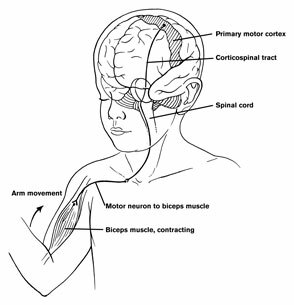 Hypotonia is characterized by a reduction in muscle tone and a loss of muscular resistance, such that if the arm is swung, it may continue, like a pendulum. Usually this disorder is seen only during the acute phase of cerebellar injury. Asynergia is reminiscent of apraxia, in that there is an inability to program the movement of the limb into a series of coordinated steps. Dysdiachonkinesia is also reminiscent of apraxia, in that the patient is unable to make rapid alternating movements of the limb. One of the most easily recognized cerebellar disturbances is what has been referred to as "cerebellar gait." Patients typically have a wide based gait, and their steps are characteristically unsteady, irregular, uncertain, and of variable length. If dysfunction is mild, these disturbances may only be noticeable when the patient is tired. However, if severe the patient may not be able to stand without assistance. Loss of muscle tone, incoordination of volitional movements, intention tremor, minor degrees of muscle weakness, fatigability, and disorders of equilibrium including nystagmus are common features. Due to these motor disturbances, it is not uncommon for afflicted individuals to be erroneous perceived as severely intoxicated. On the other hand, alcohol abuse has long been known to injure the cerebellum. The lateral cerebellum appears to be involved in regulating the timing of sequential movements, and cerebellar patients have difficulty with timing and rhythm (Ivry, 2004; Ivry & Keele, 2008). Thus abormalities in the rate, range, and force of movement are demonstrated as deficiencies in finger to nose testing. For example, when asked to touch the physicians finger and then his own nose, the patient's arm and hand may sway and miss on both counts. Irregularities in acceleration and deceleration of movement are also common which may be due to an inabilty to alter movement strategy, due perhaps to programming errors (Sanes, et al. 2016). For example, when reaching, extension of the limb may be arrested prematurely, such that the target/objective is attained by a series of jerky stop and go movements. When asked to touch his nose, the patient may do it in two stages: By lifting the arm to nose level, then by bringing the fingers to the nose. It has been proposed that the cerebellum translates motor-spatial concepts into time, that is, it is involved in timing muscle activity so as to produce smooth and accurate rapid movements (Ivry, 2004; Kornhuber, 1971). Hence, damage to the cerebellum can induce in a loss of tracking accuracy and create disjointed responses that are performed too fast (Beppu, et al. 1984; Miall, et al., 1987). These movements may become ballistic. They make their movements too quickly, and fail to slow their movements as quickly as normals. Or, the limb overshoots the mark and the error is corrected only by a series of secondary movements. However, when asked to make movements as fast as possible, cerebellar patients are slower than normals. Lateralized cerebellar signs limited to one half of the body are due to lesions (infarct, neoplasm or abscess) affecting only one of the cerebellar hemispheres. Bilateral cerebellar signs are likely a result of toxic-metabolic, demyelating, or other degenerative diseases. Cerebellar related disorders of movement and disturbances of motoric coordination also effect speech. That is, speech may become dysarthric, particularly with left rather than right cerebellar damage (Amarenco et al., 2011). In some cases with rapid and acute onset, patients may become transiently mute (van Dongen et al. 1994). Cerebellar dysarthric speech may be of two types. Speech may become slowed and slurred, particularly when required to repeat sounds ("ga ga ga"). Or the patient may suffer from a scanning dysarthria with variable intonations as words are broken up into syllables some of which are explosibly uttered (i.e. ballistic speech). Patients with cerebellum lesions experience more difficulty with motor tasks when the visual cues utilized to guide movement are eliminated. This suggest that it utilizes visual cues and integrates this with motor output (Bloedel, 1992; Stein & Glickstein 1992). However, if a patient performs more poorly due to the loss of visual input (closing the eyes) rather than because of loss of visual guidance (removing visual cues), then the disturbance is due to sensory abnormalities ("sensory dystaxia") and loss of visual and proprioceptive input rather than cerebellar damage. Hence one must distinguish between the two in making a proper diagnosis. If the disorder gets worse with the eyes closed, then the disorder is sensory in nature (referred to as "dorsal column, sensory dystaxia"). This is because the patient with sensory/dorsal column dystaxia substitutes visual guidance for proprioceptive information. The cerebellum can equilibriate only if it has proper proprioceptive information. If the proprioceptive system is interrupted at the level of the dorsal or vestibular roots of the spinal cord, the patient will suffer dysequilibrum which is exacerbated by the loss of visual input. If proprioceptive information is lacking, and the patient closes their eyes, the movement becomes more dystaxic which indicates a dorsal column abnormality. However, if the dystaxia remains the same with eyes open or closed, they are suffering from cerebellar dystaxia. The cerebellum is linked with the vestibular system as well as he cranial nerve nuclei subserving eye movements. Therefore, lesions to the cerebellum can effect eye movement. For example, conjugate lateralized eye movements or attempts at visual tracking may be characterized by a series of jerky eye movements. There is also evidence to suggest that the role of the cerebellum in visually guided movements also includes the analysis of visual-spatial relationships (Bracke-Tokmitt, et al. 2008; LaLonde, 2004; Molinari et al., 2004). For example, lesions of the cerebellum have produced striking deficits in spatial learning. 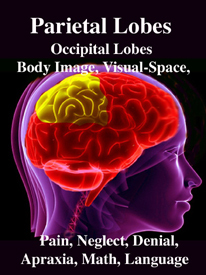 Patients with lesions in the left neocerebellum (which is interconnected with the right hemisphere) have also been shown to have mild deficulty performing cognitive-spatial operations in three dimensional space (Wallesch & Horn, 1990). Presumably these disturbances may be due to abnormalities in the interconnections between this structure and the hippocampus (LaLonde, 2004). 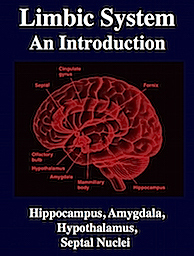 As detailed in chapters 13 and 14, the hippocampus contains "place cells" which code visual-spatial relationships including the location of various landmarks and one's movements in visual space. It is apparent that the neocerebellum contributes to and is concerned with cognitive functioning including language. For example, the right cerebellum (which is interconnected with the left hemisphere) becomes activated when asked to produce verbs in response to nouns (Petersen, et al. 2008,2008). The cerebellum also becomes activated when reading aloud vs looking at words (e.g., Petersen, et al. 2008, 2008). On the other hand, merely moving the mouth also activates the cerebellum, whereas inner (silent) speech does not. Conversely, it has been reported that those with cerebellar lesions may display disturbances on verbal paired associates tests (Bracke-Tokmitt, et al. 2008). Indeed, as noted above, dysarthria is a common symptom of cerebellar damage (Amarenco et al., 1991). In fact, with massive injuries some patients may initially display mutism (Pollack, 2004; van Dongen et al. 1994), which, however, may be due to brainstem compression involving the periqueductal gray. 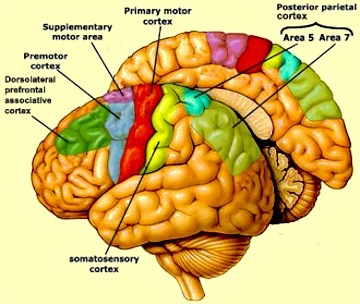 On the other hand, these disturbances may also be a function of the extensive interconnections which link the right cerebral hemisphere with the left cerebellar hemisphere, and the left cerebral hemisphere with the right half of the cerebellum. That is, these disturbances may be secondary to the disrupting influences of cerebellar lesions on neocortical processing, and/or on neocortical afferents as they pass through the brainstem in route to the cranial nerve nuclei (e.g. Pollack, 2004). Or these disturbances may be due to the possibility that complex cognitive processes are performed by and within the cerebellum. 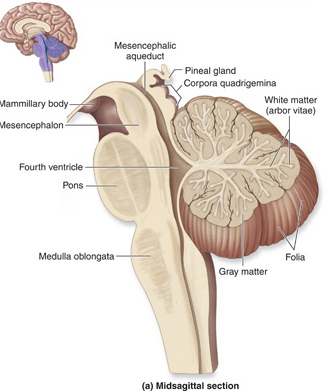 Having evolved out of the vestibular system, the cerebellum continues to straddle the medulla-pontine junction, and is anchored to the pons via the three cerebellar peduncles. It is via the pons the the cerebellum receives and transmits information (Brodal, 1981; Carpenter 2011; Schmahmann & Pandya, 2004), including impulses involving the limbic system. As noted, it is not just motor and vestibular activities with which it is concerned, but those aspects of emotional experience which may require movement. Via fibers passing through the pons, the paleocerebellum (including the fastigial nucleus and vermis) is directly linked with the amygdala, hippocampus, temporal lobe, hypothalamus, septal nuclei, nucleus accumbens, and substantia nigra (Haines et al., 2004; Harper & Heath, 1974; Heath & Harper, 1974; Snider & Maiti, 2016). As noted, stimulation of the paleocerebellum can induce violent rage and emotional reactions, including threat and attack (Bharos, et al. 2011; Zanchetti & Zoccolini, 1954), as well as autonomic changes including alterations in arterial pressure and heart rate, piloerection, dilation of the pupils, urination, gastrointestinal changes, and the production of sleep-like EEG spindles (Ban et al. 2010; Chambers, 1947; Rasheed, et al. 2015). Moreover, activation of the anterior cerebellum will increase blood pressure, heart rate, respiration, and will inhibit gastromotility, whereas the posterior cerebellum has the exact opposite effect. However, if its connections with the amygdala and hypothalamus are severed, cerebellum stimulation ceases to have an influence on these functions (Sawyer, et al. 2000). Hence, it appears that the cerebellum exerts these influences through its interconnections with, for example, the amygdala and hypothalamus. 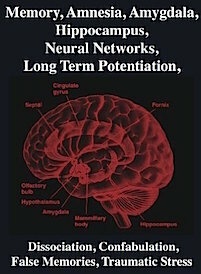 In fact, fibers from the hypothalamus appear to terminate in all layers of the cerebellar cortex which in turn project to the lateral, dorsal medial and anterior hypothalamus (Haines et al., 2004); structures implicated in the rudimentary aspects of emotion, including sexuality and control over the autonomic nervous system (see chapter 13). On the other hand, the cerebellum also appears to influence emotional and affective behavior, including the autonomic nervous system as well as the vagal nerves and solitary nucleus, through direct connections with the brainstem. 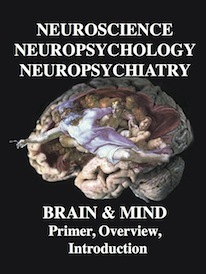 In fact, it has been shown that the cerebellum, the fastigial nucleus in particular, is "involved in widespread autonomic, metabolic, and behavior control" and "modulates the systemic circulation and profoundly influences cerebral blood flow and metabolism, and initiates long-term protection of the brain from ischemia" such that "stimulation can reduced the volume of a focal cerebral infarction by 50% (Reis & Golanov, 2004, p. 121). Because it so dramatically influences arterial pressure, the brainstem vagal centers are implicated. However, in this regard, the cerebellum may also react to external stressors perhaps through information relayed directly from brainstem pathways--that is, in conjunction with impulses and impressions shared with and received from the limbic system. Given it's intimate linkage with the limbic system and role in emotional functioning it is thus not surprising that cerebellar dysfunction is associated with emotional abnormalities. For example, it has been reported that up to 50% of patients diagnosed as psychotic or schizophrenic display cerebellar abnormalities, including atrophy of the vermis or tumors (Heath, 1977; Heath, et al. 1982; Taylor 1991; Weinberger et al. 1979, 1980). Heath et al. (1982) also argue that approximately 50% of those who are psychotically depressed show a similar pattern of cerebellar abnormality. Moreover, cerebellar hpoplasia has been implicated in autism (Bauman & Kemper, 2015; Courchesne & Plante, 2016; Gaffeny, et al. 1987); however, see Minshew et al., 1999). For example, a 50% to 60% reduction in the number of grandular and Purkinje cells in the cerebellar hemisphere have been reported, as well as reductions in the vermis of the cerebellum (Bauman & Kemper, 1994). According to Courchesne and Plante (1996, p. 49), "anatomical abnormalities of the cerebellar vermis and hemispheres in autism have been reported in 16 quantitative MR and autopsy studies from nine laboratories involving more than 254 autistic (and 220 normal) subjects." However, autistic children, have also been found to have microscopic abnormalities in the anterior cingulate, amygdala, septal nuclei, and hippocampus (Bauman & Kemper, 1994). As noted, the cerebellum is also richly interconnected with the limbic structures. Conversely, Heath (1977) has also reported that electrical stimulation of the vermis of the cerebellum can relieve chronic and intractable psychotic disturbances in over 90% of those treated. Presumably this is due to the effects of cerebellar activity on the limbic system. In fact, it has been repeatedly noted that stimulation of the paleocerebellum (i.e. the vermis) can induce electrophysiological desychronization in the thalamus, anterior cingulate, amygdala, hippocampus, orbital frontal lobes, midbrain reticular formation, hypothalamus, and the ventral striatum (Anand, et al. 1959; Rasheed, et al. 1970); nuclei that have been implicated in the genesis of psychotic and emotional disturbances (chapters 13, 16, 19, 21). 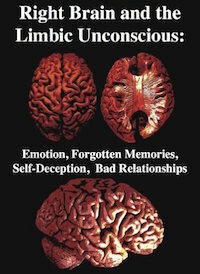 Nevertheless, these abnormalities, coupled with reports that cerebellar stimulation may induce significant improvement in patients afflicted with psychotic disorders, raises the possibility that the cerebellum may maintain not just a reciprocal relationship with the limbic system, but that it may exert an inhibitory influence on these nuclei -even when they are reacting abnormally and are beset with seizure activity or kindling. For example, it has been reported that cerebellar stimulation can decrease limbic system seizure activity , whereas ablation will result in enhanced limbic system seizures (Dow, 1975; Snider & Maiti, 2015). Conversely, cerebellar atrophy has been noted in patients with severe epilepsy (Botez, et al. 2008). On the other hand, although linked to the limbic and autonomic nervous system, rather than mediating or controlling emotional expression, the cerebellum may merely be providing the guidance for motor subroutines that make emotionally motivated actions possible. That is, the cerebellum may not be related to emotion and motivation except indirectly via its influences on the motor system. For example, stimulation of the fastigial nucleus, vermis, and superior cerebral peduncle can trigger biting, chewing, swallowing, and lip and tongue movements (Bernston, et al. 2013). However, stimulation of the cerebellum does not trigger searching for food. Hence, rather than motivating hunger, the motor program associated with eating are being triggered, for animals will approach and pick up pieces of food as well as non-nutruitive substances and swallow them. Similarly, although stimulation of the paleocerebellum can trigger rage like reactions, they are undirected and seem at best semi-purposeful (i.e. "sham rage.") 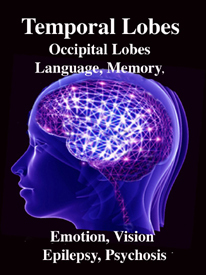 Therefore, the motor programs for these emotional behaviors may be stored in the cerebellum. Removal of the cerebellum does not eliminate these or other emotional behaviors (Bernston, et al. 2013). The cerebellum obviously plays a significant role in all aspects of motor functioning, and contributes varying influences on cognition, learning, memory, language, and emotion. However, it is yet to be determined if its role in cognition and emotion is secondary to providing the motor foundations, or if this structure actually thinks, talks, listens, and experiences emotions.